If you ride a motorcycle, you know all about helmet hair. Defined as ...."hair that lies flat to the skull at all points where said skull comes into contact with protective helmet." I have a lot of hair - thick hair. Hair that hurts after wearing my helmet for an entire day. Hair that may not even become unstuck from my scalp after a good scrubbing in the shower. Yep, I know all about bad motorcycle-related hair. Is there anything that can keep it from happening? I have tried to disguise my flat hair for photograph taking - not too successfully. This method requires a willing, able-bodied assistant. Often, I utilize the "I will never remove the helmet"
All I really want is something that make the flat hair go away after the helmet is removed. Until some creative inventor markets a solution, I will resort to baseball caps. If you have long hair, you might want to tuck it away in a leather hair glove. Since 2007 we have asked our visitors the question "How do you deal with Helmet Hair'? And you have answered our question. Since that time we have received nearly 300 responses from visitors to our site. These responses have generally centered around three main themes - hair care products, hairstyles and head gear. Hair Care Products & Accessories. Have you heard about Menthogen? Our visitors are awesome. Everyday we receive submissions and comments from you and its a highlight of our day to read them all. Because of you we have learned about Menthogen ( M-Gen ) and your experiances with using M-Gen. If you would like to know more about Menthogen please read this article we've written about Helmet Hair Solutions that we've learned from you. But M-Gen isn't all that you told us about. Check out some of the products our visitors have recommended we have 3 pages of tips sent in by our visitors. Some of our visitors are convinced that there is a certain style you should wear your hair if you want to avoid helmet hair. One of my favourite threads is about Lydie and her amazing flat top haircut and when she went red in 2012! But our visitors have many more suggestions about the best way to wear your hair if you are going to avoid helmet hair. 2 pages of motorcycle hairstyles sent in to us - here and here! Headgear. We're not talking about Helmets here, although you should always wear one, we are talking about things like do-rags, scarves, helmet liners, ball caps. Have a look at the responses from our visitors on what you should wear if you want to avoid helmet hair! How Do you Deal with "Helmet Hair"? If you are a rider, or a passenger, then no doubt you've had it - helmet hair. Hopefully, you also have some methods for dealing with it. Share your tips on curing the dreaded helmet hair! Before and After pictures would be lovely...(or not) Click the button and find it on your computer. Then select it. I'll do the rest. Here you will see submissions of other readers, as well as comments. 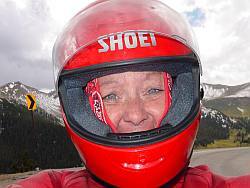 If you are the first, don't be shy - remember, we women motorcycle riders are the adventurous type, right? A small bottle of spray on conditioner. The tangles come right out! Flairhair.com has the coolest bandanas and hats. No more helmet hair. I always have one with me. This is my helmet hair care, Did the same as Flat Top Annie today... didn't colour it up hey.. It still works!! R u sure u should b riding if yur so worried aabout yur hair! If you can rock short hair, a short pixie cut looks super cute no matter what you do (or don't) do to it. I guess the only real cure to helmet hair is to shave your head....otherwise try to ignore it! I always take a ball cap with me and tuck a hairbrush in my tank bag. And just in case, a pair of well placed sunglasses will work in a pinch. I wear a cap or bandanna after I take my helmet off!! I wear a Harley hat, bandanna or some sort of hat on my head after I take my helmet off!! Carry a travel sized spray bottle, spritz your hair with water the minute the helmet comes off. Finger fluff. Take a wig with you. When you want to look cute, it can be rolled up and stored in your pocket or back seat. 2 minutes in the bathroom and you are a diva again! Hair dryer and brushes to fix it once I'm at work. Baseball caps just won't cut it at work..
You mean you don't look like all those models pictured on motorcycles? I try to use as little hairspray as possible, my hair doesn't tangle and matte together so much. What can i do to prevent my head from itching when wearing a motorcycle helmet? Wear a tube top or low cut blouse and no man will ever look high enough to notice your hair. 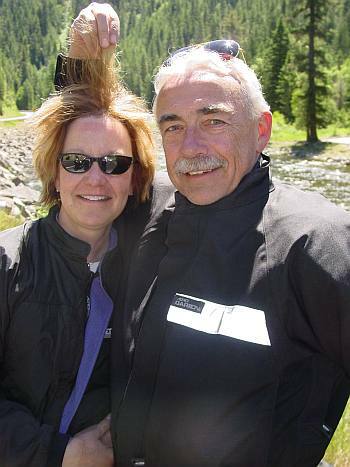 If you are so concerned about helmet hair, don't bother getting on a motorcycle. Who cares! We're hot biker babes! Styling produt on wet hair; dry; curling iron; dew -rag to cover. You hair will easily fluff up with a pick when you take your helmet off. still puzzled by it, but perhaps cut it off!